NEWTOWN, Conn.--St. Rose of Lima Roman Catholic Church was evacuated during its noon mass on Sunday due to an anonymous threat made by phone. A spokesman for the church told Yahoo News that an unidentified male called the rectory, threatening to "kill everyone." "My friend didn't finish the job," the caller said, according to the church official. The church alerted state police, who said it was a credible enough threat and ordered the church be evacuated, the spokesman said. At approximately 12:30 p.m., Monsignor Robert Weiss interrupted a younger priest, "calmly told the parishoners there was a threat," and led the evacuation of approximately 500 people, he said. Heavily-armed patrolmen and SWAT team members surrounded the church with weapons drawn. Police formed a perimeter around the church and several adjacent buildings, including an empty education center. The media, which had been barred from attending the mass at St. Rose but were camped out across the street, swarmed to capture footage of the chaotic scene. Approximately a dozen police and SWAT officers surrounded a white building just west of the church, taking cover behind trees with guns drawn. A Newtown police officer declared the scene was "clear" at approximately 1:15 p.m., but declined to answer any questions about the threat. At 2 p.m., a Humvee carrying the tactical unit left the church parking lot. 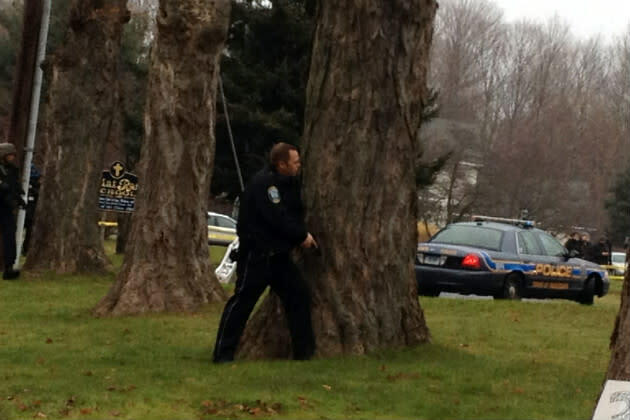 The Newtown Police Department headquarters also declined to comment on why officers rushed to the church. "No, we don't have any information on that," a hurried police dispatcher told Yahoo News. At least 10 of the 20 children killed during Friday's massacre at Sandy Hook Elementary School were parishoners at St. Rose, the church spokesman said, adding that funerals for eight of the children are scheduled to be held there. It's the second threat in as many days for St. Rose, according the Washington Post. On Saturday, the church displayed posters for parishioners to express their grief. However, an unknown prankster wrote, "This is just round one," on one of them, the pastor said. By 2:30 p.m., the church had closed its doors and cancelled their evening mass.